I seem to be on a savory pumpkin and cheddar kick. I still like pumpkin in sweet things too, I just happened to have a lot of it on hand after roasting one a couple of weeks ago. And, since the flavor of pumpkin, and winter squash and sweet potato, goes so well with Southwestern spices and chiles, I was excited to try these enchiladas. I found this idea in the Everyday Food: Great Food Fast book. The enchiladas are filled with shredded chicken mixed with some green onions, the sauce is a puree of pumpkin with chile powder and jalapenos, and the enchiladas are topped with grated cheddar cheese. As usual, I took the long way around in making this, but it could be put together very quickly. I had already roasted and mashed some pumpkin, but canned would be fine. Then, I roasted a couple of chicken breasts to use in the filling, but bringing home a rotisserie or smoked chicken would have saved that step. So, with pumpkin puree and cooked chicken at the ready, you start by combining shredded chicken with sliced green onions and seasoning the mixture with salt and pepper. Then, the sauce is made in a blender by pureeing pumpkin, garlic, jalapeno, chile powder, water, and salt and pepper. Next, some of the sauce is poured into a baking dish, corn tortillas are filled with the chicken mixture and a little grated cheddar and set on top of the sauce, and the remaining sauce is poured over the enchiladas. Grated cheddar is sprinkled over the sauce, and the enchiladas are baked for about 30 minutes. I garnished with sliced jalapenos, cilantro, and pepitas. Pumpkin with spicy chiles is a yes, and pumpkin with cheddar is another yes. There was no way these enchiladas could be anything but good. Actually, they were great. The baking dish was empty in record time, and I'm hoping I still have enough cooked pumpkin in the freezer to make this again soon. Have you seen mentions of the Fairy Hobmother lately? I can tell you she's real. She's from Appliances Online, and she visited me recently and sent a lovely gift. If you leave a comment here with a wish for her, she may visit you too. Enchiladas are awesome and this version is just amazing! A great idea and so healthy. They definitely look absolutely amazing Lisa! It's definitely the season for these kinds of dishes! These sound so comforting right now Lisa.I was in the States recently and found all the cheeses I would need to prepare authentic recipes I love. This is something i need with every ounce of my being! LOVE pumpkin. this is such an inventive dish! 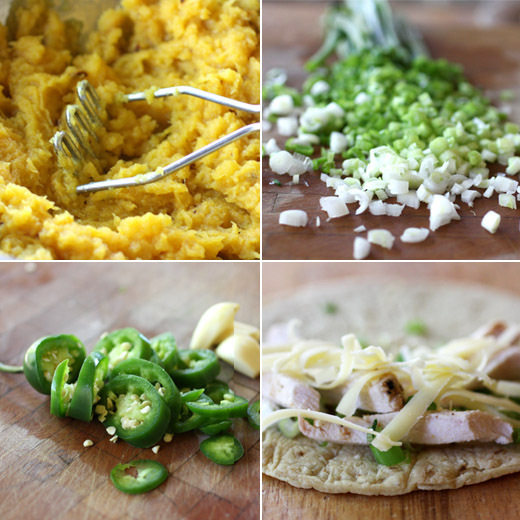 This looks terrific- I love the idea of a southwestern spin on pumpkin! I'm glad someone else gets on kicks too. I'm on a ginger kick myself lately. I tend to not like pumpkiny desserts so I'm loving this series of savory pumpkin dishes you're doing. Mmm, sounds like the perfect comforting flavor combo! This sounds so intriguing. I might have to tackle this dish in the near future. Also, I'm glad I'm not the only one who bypasses the rotisserie chicken and just roasts her own chicken at home for dishes like this. This sounds like a perfect autumn enchilada. Nice flavor combination used. You sure have whipped up an intriguing meal here, Lisa. It looks so festive too!!! The combination of ingredients screams, spicy autumn!!! 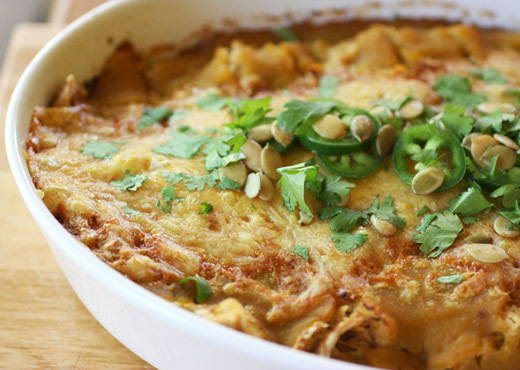 What a great fall version of enchiladas! This is the first pumpkin cheddar combo I have seen this fall! Great idea incorporating it into some Tex Mex for enchiladas. That picture tells me that it would be a hit on our table. Well done! Great dish and fabulous idea! Will try it asap. These look delicious! Can't wait to try this recipe! These look and sound AMAZING! Love enchiladas...and these are top notch! Can never say no to pumpkin and cheddar. Love the touch of heat in this too. What an amazing recipe, Lisa. Love all those flavors and the entire dish spells comfort and fall! This is brilliant! I must try it! These look so good, and I have a couple pumpkins waiting to find their way into a dish...! 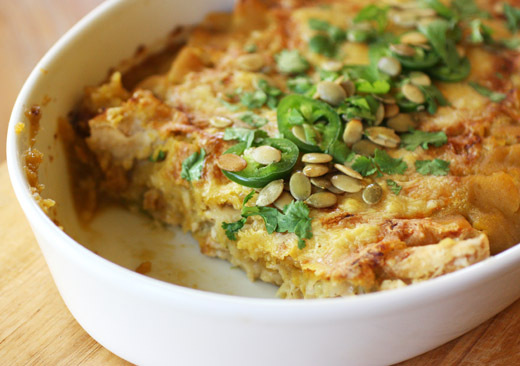 i feel like sneaking pumpkin into an enchilada dish is one surefire way to get me to enjoy the orange stuff. very clever creation! Yum Lisa! Tyler made me enchiladas last night. But they were just regular bean ones. You are setting a standard to my dinner! Lisa, love the combination of textures and flavors. Especially with the pumpkin. Looks good!! !